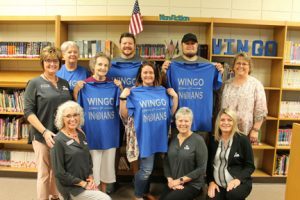 August 8, 2018 (Mayfield, KY) FNB Bank is proud to announce that they have donated t-shirts to Wingo Elementary School’s VIP (Valued Indian Partners) Volunteer Program. The VIP Program is new for the 2018-2019 school year and consists of community and parent volunteers who graciously donate their time to the school system. At this time there are approximately 50 volunteers enrolled in the program. FNB Bank, founded in 1875, is one of the oldest banks in the state of Kentucky and ranks among the highest in the nation in the area of safety and soundness. The bank currently has eight locations: Mayfield Main, Mayfield Southside, Wingo, Lone Oak, Paducah, Murray, Cadiz Main, and Cadiz West. FNB is member FDIC and an Equal Housing Lender.